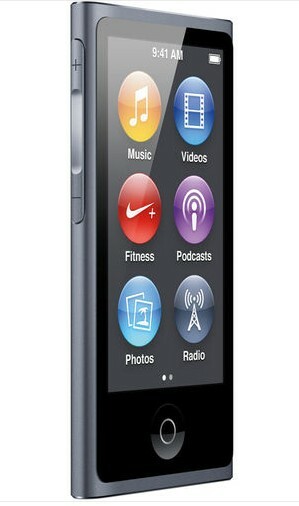 Say this on eBay and had to share - get a new Apple iPod nano (16GB, 7th Generation) for just $100 and get FREE shipping too! This retails for $150 at the Apple Store. Note: It says it's an open box item, which only means it might have been on display or the box was damaged in the warehouse, not that it was bought or returned by a customer. I own one of these, so I can vouch for how awesome it is. It's about the size of a credit card, can hold thousands of songs. Unlike the older one, this has a big screen so you can actually scroll through music or change radio stations without squinting. You can even watch videos or look through photos on the display! Before you ask, yes, it does have Bluetooth now so you don't have wires dangling around. It comes with Nike+, which monitors your exercise and let's you monitor your fitness progress.